Happy New Year! 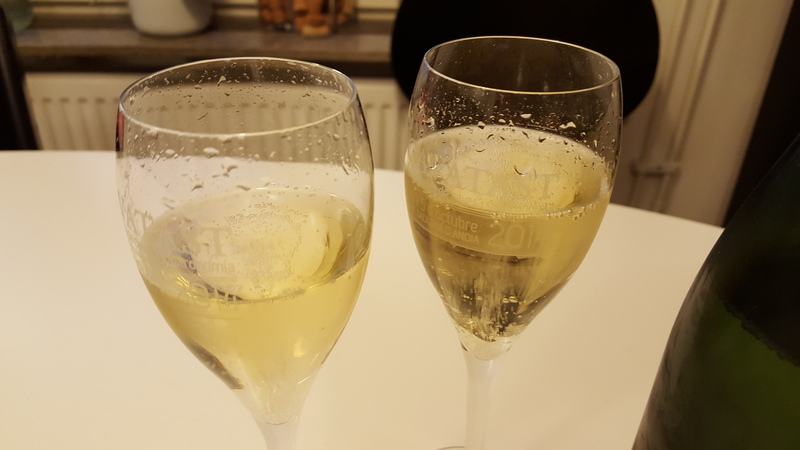 What better way to start a new year of blogging than a wine review. I haven’t written those in a while. This time you are in for a treat as I have been tasting some Vietnamese wine. Yum yum…perhaps not, but interesting nevertheless. We picked up two bottles at Saigon airport just before departing to Singapore and a few days ago mustered up the courage to open a bottle. As white wine seemed like the safer choice we decided to open the Vang Dalat Excellence Chardonnay. Like with most other Asian countries, wine is not the first drink that comes to mind when thinking about Vietnam. Nevertheless, Da Lat city, with its cool central highland climate and strong French heritage is an anomaly producing wine. The grapes come from nearby Phan Rang which is Vietnam’s main grape-growing region. The wine is said to be made according European wine making practices, but I did not find very much information about it online. What is nice is that the wine is made affordable for locals, but this specific bottle of Chardonnay was produced for the export market and set us back 13 US dollars at the duty free. The wine was straw colored and the initial sniff fresh. The nose of the wine was actually quite pleasant in this hot weather with tropical fruits, lemon and honey. The taste of the wine had white fruits and lemon, accompanied by that oxidized taste of cooked fruit that I associate with spoiled wine. It was faint, but nevertheless it was there. I cant really put my finger on it where it comes from. Perhaps late harvest or over heating during the fermentation process. It is however quite common, and as I have understood it even preferred by locals in China and Vietnam. Taste is taste, what can you do. Vang Dalat, is available in most cities and provinces in Vietnam and its exported to China, Japan, South Korea, Malaysia, Cambodia and Switzerland. It is also available to buy in Germany, however the price tag really does not match the quality (~20€). I would not recommend buying it for the quality. However, many decisions these days come down to interesting versus delicious. So if you are into new things – why not! Although I would like to give some points for a good attempt, I just cannot do that. Otherwise I would not be true to the scoring system. So both quality as well as value for money get one point out of five (even that is a bit generous). We drank one small glass and poured the rest. I always get excited when I find an excellent value for money -wine to share on this blog. That is kind of the purpose of it all, to build a wine-community and share ideas and information. There are thousands and thousands of wines out there, how to otherwise know which one to pick of the shelf? “Domaine Badoz” is located in the town of Poligny, in the heart of the Jura region. Its origins date back as far as 1659 and Benoit Badoz represents the 10th generation of winemakers at the family domaine. He cultivates 10 hectares of vineyards with the aim of maintaining a natural ecological balance; grass is planted in every other row and no chemical are used in the fields. The production process, grape reception, vinification and aging are also efficiently organized and environmentally friendly. The wine is not classified as ecological or bio dynamic, however the focus is on making great wines by taking good care of the land and grapes. 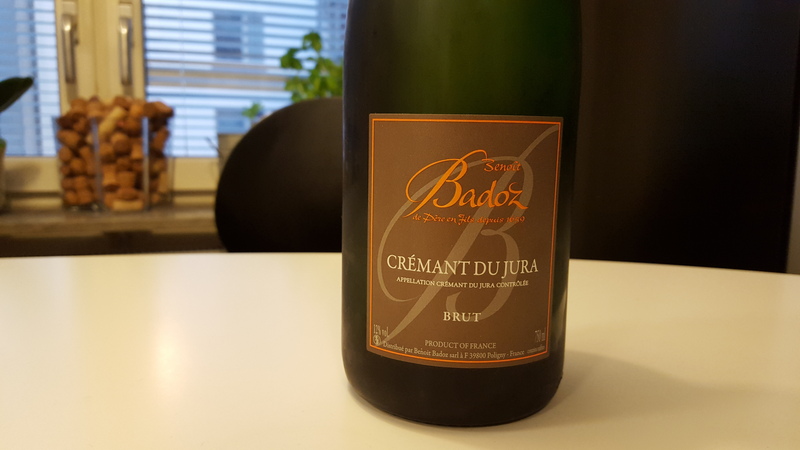 A good grape will speak for its self, and the Benoit Badoz Cremant du Jura is proof of that. The wine is made from 100% Chardonnay and it has a lemony and sweetly refreshing nose. The taste is crispy, with yellow apples, pear and minerals. The sweetness in the aroma is deceiving as the wine its self tastes very dry. The wine has a persistent stream of teeny tiny bubbles contributing to a pleasant creamy mouth feel. All in all a very refreshing appetizer. Being a wine merchant, you seldom drink your own wines. You take a sip in tastings to make sure the wine you are serving is ok, but you do not open a bottle that often to relax. It’s a bit silly, as the wines in our selection are some of the best I know. Perhaps it is just the continuous thirst for new things that seduces me to open something different every time. Last Friday we stayed firm and cooled down several options from our own lot and the one that called out to me most was the fresh and pearly, Rimarts Chardonnay. 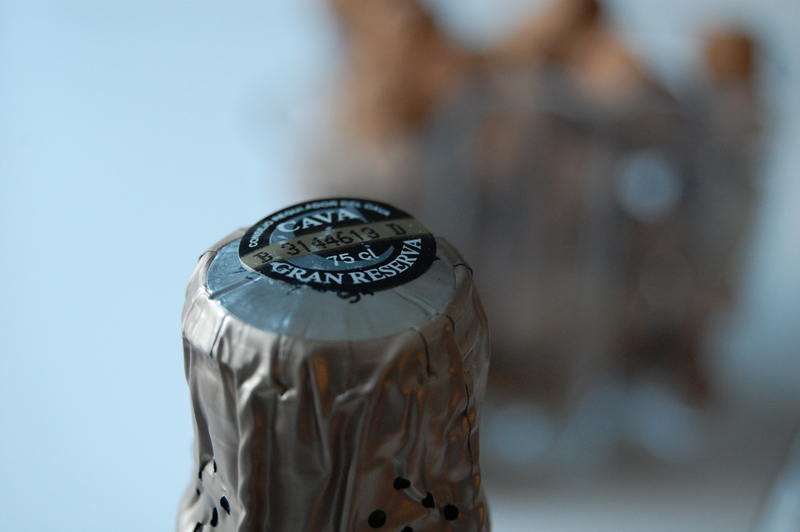 The black cava-label is a guarantee of a long ageing. Light straw color with lively bubbles. I have written to you about Rimarts before (story here). The cava house is owned by two brothers and they do everything by hand. Rimart’s produces true artisanal cavas. They source their grapes from trusted growers and handle the rest of the process by themselves (with a little bit of help from their mother). Bottles are aged to their peak and disgorged (re-corked) upon order. The Rimart’s cavas are perfect to drink now and require no additional maturation. The Reserva Especial Chardonnay has been aged for minimum 40 months and is a Brut Nature with less than 2g/k residual sugar. Chardonnay is not an indigenous grape to Penedes. 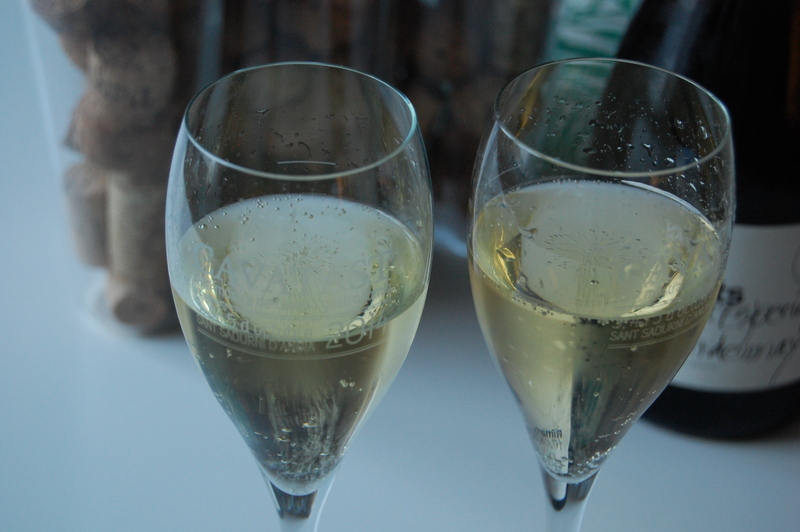 It has however become more popular recently with the growth of specialty cava as a premium drink. Chardonnay is a grape often used in the production of champagne, so it’s reputation has made it an attractive option for adding as an ingredient also in cava. Chardonnay, when aged properly, gives sparkling wine some of those brioche and nutty flavors that is one of my favorite characteristics in a good bubbly. 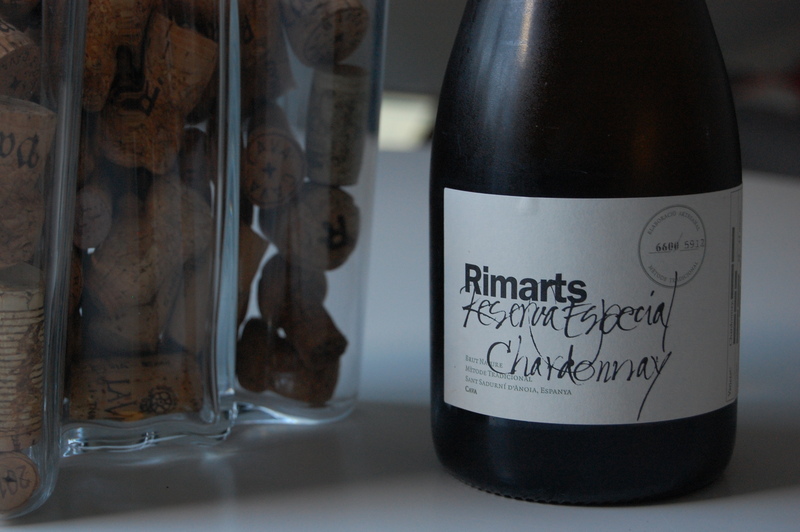 The Rimarts Chardonnay has a fresh nose with some citrus, green apple and baked bread. The taste is bone dry with light acidity and mineral freshness. After some time and air the wine gains some body and the yeast and brioche flavors take over. It is almost worth the price of some bubbles waiting for the wine to breathe. This is a wonderful cava and it resembles more champagne in the taste than other sparkling wines. I would recommend pairing it with some lightly salted snacks, charcuterie or hard cheeses (parmesan, comte or gryuere). All in all, I give the Reserva Especial Chardonnay a 4 in pure quality and a 4.5 in value for money (242 SEK per bottle/ 1450 SEK per box), from our webshop of course. Our customers seem to agree with me as we actually sold out of this wine immediately when we received a shipment in May. It is a real star in our collection and a given favorite for years to come. Thank you Ricard and Ernest for making such a wonderful wine!